Being injured in an accident is difficult at any age, but car accidents can be especially traumatic for older drivers. Drivers over age 65 often worry they'll be blamed for an accident solely because of their age and be forced to stop driving as a result. However, this fear is unfounded. With an experienced attorney by your side, you can receive compensation for your accident-related experiences without worrying about age discrimination. Statistically, older drivers cause fewer car accidents than any other age group. However, this is primarily because they are no longer driving long distances on a regular basis. If you measure accidents per mile driven, the rate steadily increases for drivers age 65 and over. Some people in their early 60s have limitations that make it hard to drive, while others can easily drive down a busy interstate in their 80s. There is no reason to assume that someone is an unsafe driver solely because of age, and there’s no magic age at which someone should stop driving. 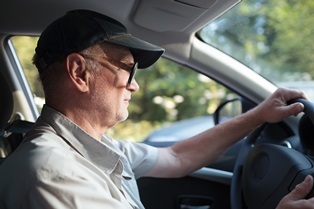 Every state handles senior drivers a little differently, but there is no state where your license is automatically taken away once you reach a certain age. Louisiana law requires drivers age 70 and over to renew their license in person every four years and to complete a vision exam as a condition of renewal, while most younger drivers are allowed to renew online. However, older drivers do not need to complete a written or road test unless there is indication of driver impairment such as a report from a doctor about a medical condition affecting driving or an unsafe driver report from a concerned citizen. If you were speeding, ran a red light, or made some other mistake that contributed to the accident, you could be found partially at fault. However, this doesn't mean you won't be entitled to compensation. Under Louisiana law, your settlement will be reduced by your assigned percentage of fault. This means, if you're found to have been 10% at fault for the accident, you'll receive 90% of what you'd be able to receive if the other driver was solely at fault. Even though most personal injury cases involving car accidents are settled out of court, this doesn't mean it's a good idea to forgo legal representation. An experience attorney can gather evidence, locate relevant experts to testify on your behalf, and negotiate with the defendant's insurance company for the highest possible compensation. If you are partially at fault for the accident, your attorney can also help negotiate a lower percentage of fault—thus increasing the overall size of your settlement.